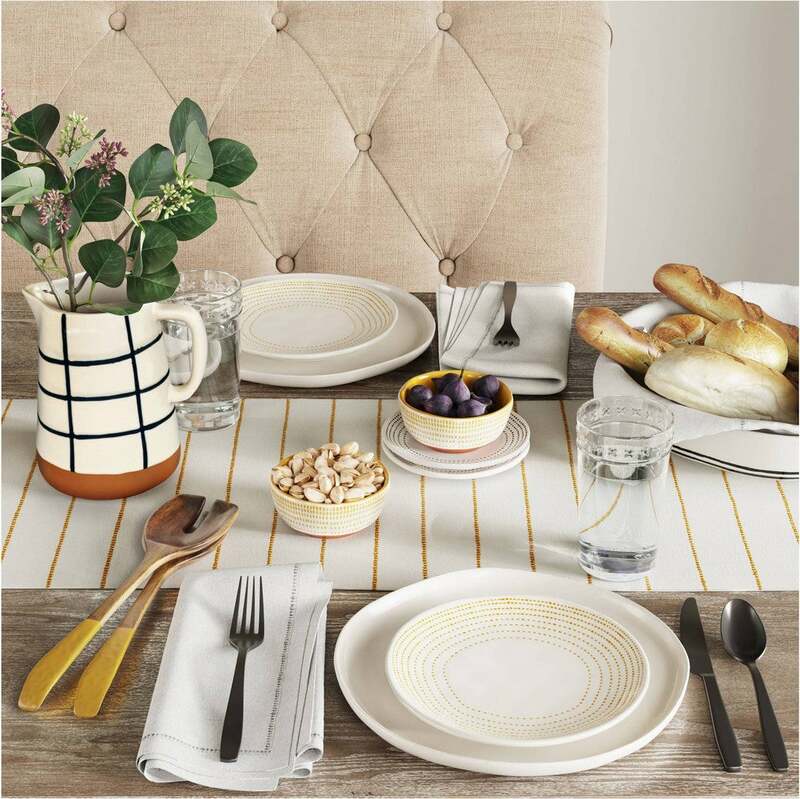 Your dinner parties just got chicer. It might seem a tad early to start planning for spring entertaining (especially given that there’s still snow on the ground in certain parts of the country), but this gloomy weather has us wishing for brighter days—specifically, all the perks that come along with brighter days. From dining al fresco to Easter brunches to dinner parties featuring fresh, seasonal ingredients, there’s a lot to be excited about in terms of entertaining. The Hearth & Hand with Magnolia line—otherwise known as Chip and Joanna Gaines’ Target collection—is yet another reason to get pumped for the new season. The duo released a new range of gorgeous items late last year, and now that it’s finally a bit more seasonally appropriate to start stocking up on springtime essentials, we’ve put together a list of our favorite tabletop pieces for easy entertaining. Bright and cheery, this striped stoneware pitcher will add just the right amount of color to your tabletop. Whether you use it to display plants as a centerpiece or as a serving vehicle for mimosas (is it really brunch if you don’t have mimosas? ), this affordable item is one you’ll definitely get use of this season. Add a hint of the Gaines’ signature farmhouse style to your tablescapes with these simple striped napkins. The subdued green is just subtle enough to work with pretty much any color scheme. One of the markers of having it together has to be owning coordinated salad servers instead of using whatever spare utensils you have lying around. These durable wooden options are dipped in a pretty yellow for a small touch of color that will make salad a bit more interesting. Speaking of salad, these simple stoneware salad plates (say that three times fast) are great for when you want to achieve that layered tablescape effect. Place under bowls to let the colorful border peek out, or on top of a solid-colored plate for a bit of contrast. If you’re the kind of person who has afternoon tea—or if you’re the kind of person aspiring to be the kind of person who has afternoon tea—you need a good serving set. The coffee pot is really perfect for serving any kind of warm beverage, and the matching mug can be used either as a mug if you’re dining solo, or as a cream/sugar container if you have guests. While it’s not technically an entertaining essential, having a colander around will make prep time before your next get-together exponentially easier. You can even fill it with seasonal fruit and use it as a slightly unconventional rustic centerpiece when in a pinch. These nesting canisters come in three sizes, but the smallest is particularly useful for storing condiments on the table. The slightly imperfect finish of each canister makes the set look handmade—a unique addition to any tabletop. As any frequent host will tell you, it’s important to have a towel constantly on hand and within reach for serving hot dishes or cleaning up spills. Go for a chic option you’ll actually want to display, like this coral-colored set.